Who were our earliest ancestors? How and when did they evolve into modern humans? And how do we define "human," anyway? Was it when some long-ago ancestor stood and walked; grew a brain of a certain size; or figured out how to make stone tools, control fire, plant crops or brew beer? The possible answers to such questions are themselves evolving, as anthropologists and archaeologists continually discover new fossils and artifacts that upset old theories and push the known dates of evolutionary milestones back ever further into the past. Most anthropologists believe that east Africa's rift valley played a central role in human evolution. Spanning nine nations from Mozambique to Ethiopia, it has been the site of many key discoveries of fossils and artifacts. 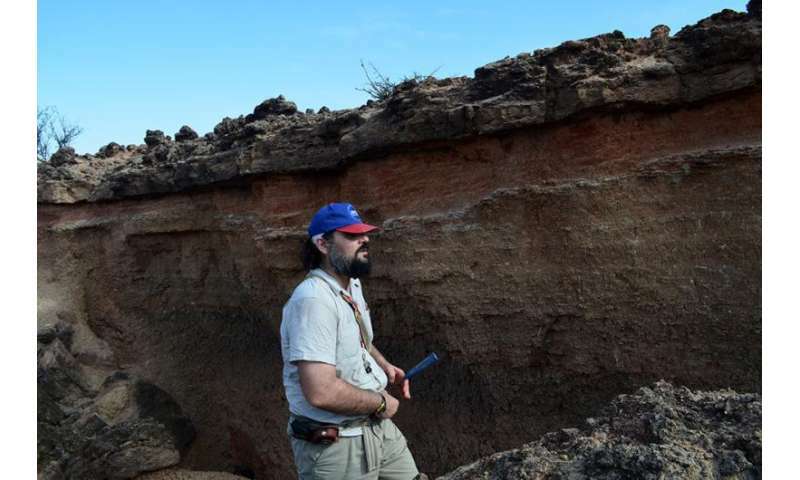 Christopher Lepre, a geologist at Columbia University's Lamont-Doherty Earth Observatory and Rutgers University, has been working in the Lake Turkana region of northwestern Kenya for the last two decades, and has been involved in some of the most dramatic recent finds. These include the spring 2015 announcement of the discovery of the world's oldest stone tools. At 3.5 million years, they long predate modern humans and their closest ancestors, jolting conventional theories of human development. 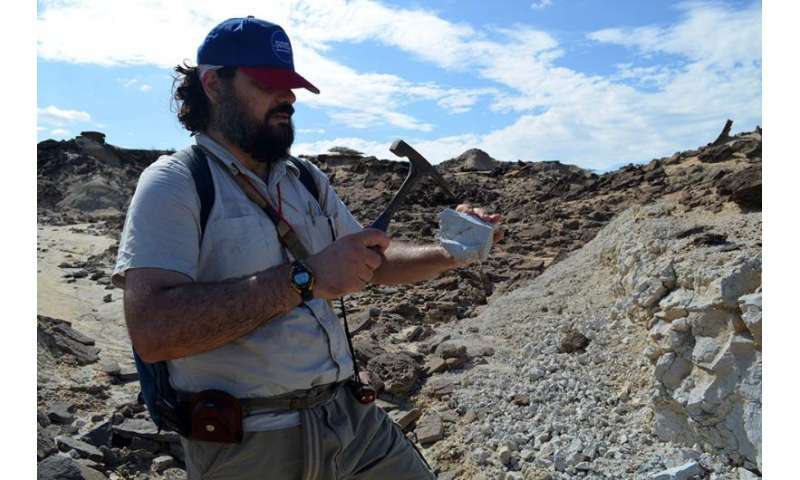 "This is a good place to study human evolution, because you have all the right kinds of rocks here," said Lepre one day while surveying a rugged stretch of badlands near the shores of Lake Turkana. "Things have built up here. You get the whole human story in this one small place, all the way from apes and monkeys, right down to modern people who made pottery and domesticated cattle." The rift valley is an ideal storehouse of ancient remains. For the past 30 million years or so, the African continent has been slowly pulling apart here. As it does, the surface stretches like taffy, and sags, creating a depression dozens of miles wide and more than 3,000 miles long. Sediments tend to wash downhill, and cover up objects such as bones and tools. Eventually, old sediment layers may get re-exposed as wind, water and earthquake faults rip the surface, creating deeply dissected badlands and seasonal watercourses. Studies show that past climates here have been wetter and more hospitable for developing humans. Now, the Turkana region is brutally hot and dry, with only a scattering of thorny plants, if anything grows at all. That means objects on the surface don't decay much, and are easy to spot. Towns and roads are almost nonexistent. The region is inhabited mainly by the Turkana, a seminomadic indigenous people who survive mainly by herding camels and goats. Until recently, they had relatively little contact with outsiders. Lepre is fond of pointing out that his work area is about the size of his home state of New Jersey, but after that, there is not much resemblance. Discoveries have included items left by our own species, Homo sapiens, and many earlier hominids (a general term for great apes, proto-humans and humans). In 1974, researchers in Ethiopia, just to the north, found "Lucy," the 3.2 million-year-old partial skeleton of an upright-walking Australopithecus afarensis; this species is thought to be an important precursor to the Homo genus. Ethiopia also yielded what was until recently the earliest known Homo fossil: the 2.3 million-year-old jaw of a Homo sapiens predecessor called Homo habilis. In 1984, researchers in Kenya led by Richard Leakey found a 1.5 million-year-old skeleton dubbed Turkana Boy (also known as Nariokotome Boy), a 9- to 12-year-old from a yet more advanced species, Homo erectus. Turkana Boy is still the most complete known skeleton of an early hominid. Recently, other big discoveries have piled up swiftly. In March 2015, scientists announced an even older Homo habilis jaw, going back 2.8 million years–a potential missing link in the largely blank spot between Lucy and later hominids. In May, another team announced it had identified a new hominid species dated at about 3.5 million years, an apparent cousin of Lucy's line–another possible ancestor. Then there was the study Lepre coauthored, the May 2015 announcement of the 3.5 million-year-old stone tools–makers unknown. Identifiable remains of Homo sapiens go back only 200,000 years. No one knows exactly how all these pieces fit together, and some of the finds seem only to complicate the picture. Many leading discoveries have been credited to three generations of the Leakey family, who started working in Tanzania during the 1930s. In the Turkana region of Kenya, Richard and Meave Leakey, the second generation, were instrumental in founding Stony Brook University's Turkana Basin Institute, which has two research stations that help researchers stage logistics in remote areas. Lepre began working around here as a student in 1997, eventually collaborating with the Leakeys and other researchers on a variety of projects. He has a PhD. in anthropology, but is known mainly for his geologic expertise in dating the fossils and artifacts found by others. He does this using paleomagnetism–the study of periodic reversals in earth's magnetic field. These reversals have been well charted going back many millions of years. By sampling and analyzing magnetized minerals within numerous layers of sediments and rocks, one can come up with ages of objects far too old to be dated using conventional carbon isotopes. In 2007, a team of French and American researchers working in West Turkana dug up a set of stone hand axes. Nicely sharpened on both sides, they were good examples of so-called Acheulian technology, the first sophisticated stone tools, thought to coincide with major advances in brain development. The oldest ones known went back 1.5 million years, the time of Turkana Boy. However, Lepre analyzed the new finds, and showed that these were older. In 2011, he was lead author of a paper in the leading journal Nature that dated the axes to 1.8 million years. Different, more primitive tools were known to go back 2.6 million years. This new study suggested that modern intelligence had deeper roots than thought. It also raised the question of whether even older precursor tools of some kind might turn up. 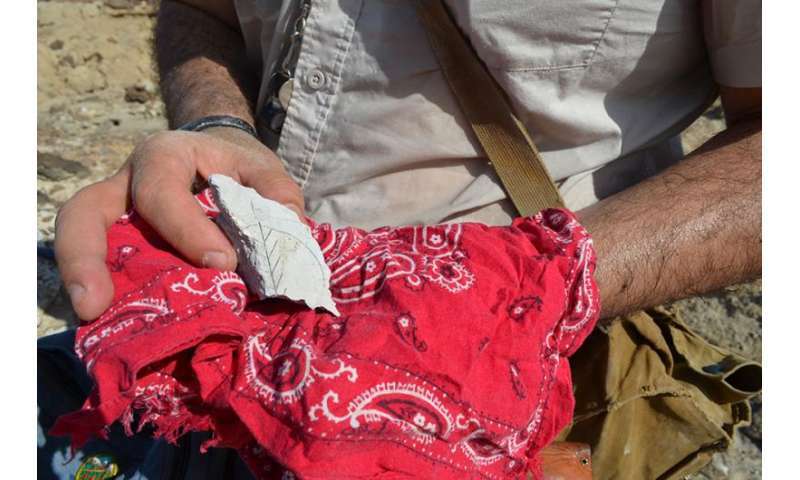 The same year that this paper came out, Sammy Lokorodi, a Turkana tribesman working with Stony Brook archaeologist Sonia Harmand, spotted some even more primitive-looking tools sticking from a set of craggy outcrops in the northern Turkana region. Excavations brought up more than 100 objects–big, clumsy things of unknown purpose that would have taken two hands to hold. They were crudely knapped only on one surface, but definitely shaped by some intelligent creature. The team called Lepre, who arrived within a week, and he began studying nearby sediment layers. A layer of volcanic ash suggested the tools were around 3.3 million years old. Lepre refined the date using paleomagnetism, showing them to be 3.33 million to 3.11 million years old. The discovery, published by Harmand and her colleagues this year, resets the entire archaeological record back some 700,000 years. They call this newly discovered toolmaking era "Lomekwian," for the site where the find was made. "Now we have this huge gap between what we know to be the oldest tools, and the second-oldest. That's opening up more questions than it's answering," says Lepre. Harmand says she is confident that even older finds will eventually turn up. This is not the only recent study suggesting that human-like intelligence goes way back. For instance, in June 2015, researchers based at Harvard University published an experimental study suggesting that chimpanzees understand and appreciate the concept of cooking, and would do it themselves if given the tools. 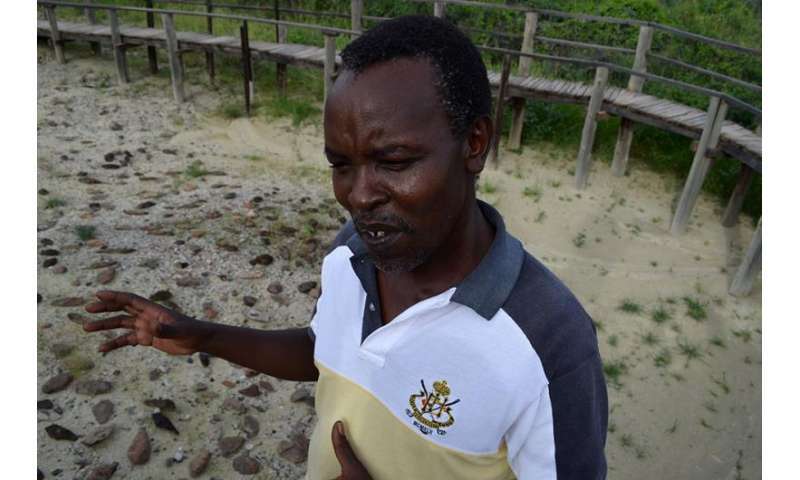 During Lepre's most recent trip, in June 2015, he spent several days near the Turkana Basin Institute's western outpost, on a bank high above the shallow Turkwel River. Here, he knocked out samples of volcanic tuff and sands from the badlands for later lab analysis. Much of the exposed surface around here is thought to be around 3.5 million or 3.6 million years old, but the layout is far from uniform. The landscape presents an often bewildering array of jumbled layers that have been worked and reworked by old rivers, lakebeds, earthquake faults and volcanic eruptions. This could throw researchers off the true ages of objects found within them. Lepre sees his job as reassembling the puzzle pieces in each locale. One big question: How did past climates affect this area, and how did that in turn affect human evolution? Near the research station lies 180-mile-long saline Lake Turkana, which stores nearly all the region's scant surface water. As judged by old shorelines and lake sediments, 5,000 or 10,000 years ago it was probably some 300 feet higher and covered a much larger area. Lepre and others would like to better understand the timing of when things dried up, what drove the shift, and how it affected people around here. The wider issue: Was the Turkana region a locus of early evolution, as many say–or is it just a good place for preserving fossils? A November 2015 study by Finnish researchers suggests the former. 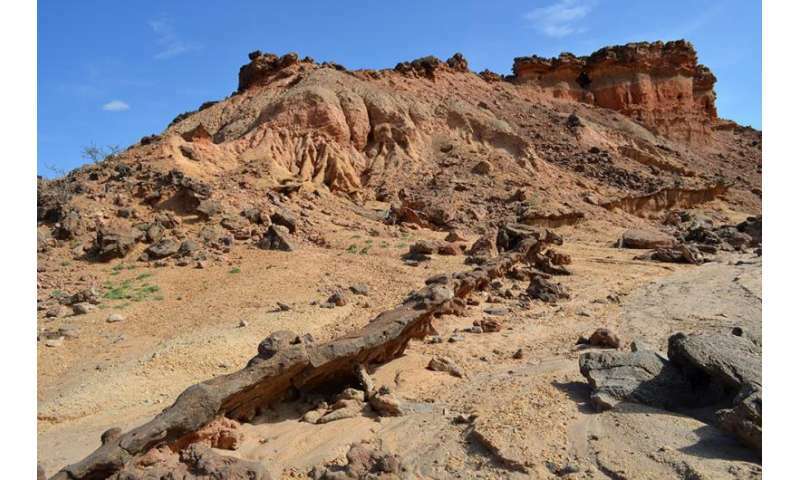 The team did a deep-time analysis of east African climate, and showed that the wider region became drier 2 million to 3 million years ago, as the genus Homo was emerging. 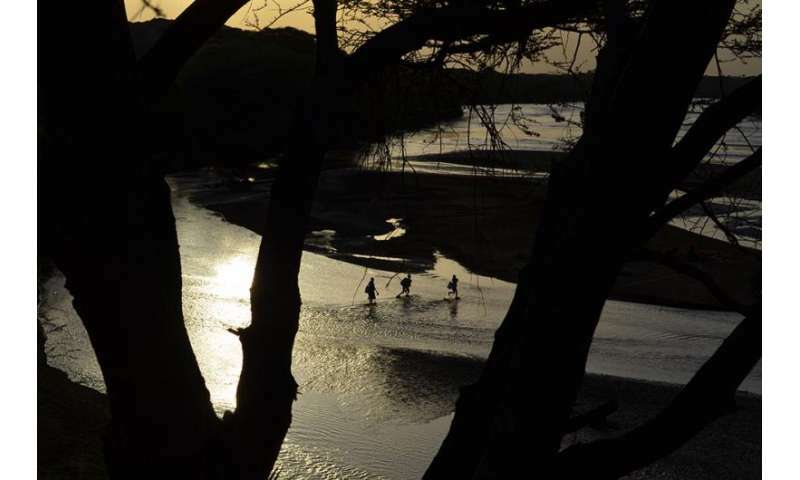 This agrees with earlier research by Lamont paleoclimatologist Peter deMenocal, who argues that the drying and subsequent conversion of humid forests into savannahs helped drive the evolution of the first upright-walking human hunters. The newer study is more specific: it shows that the Turkana region in particular started drying out first, before adjoining regions. This may have created a kind of hothouse for the development of early humans who could then spread out and thrive as wider areas also became arid. One day, Lepre and Lamont-Doherty geochemist Tanzhou Liu were dropped off by Land Rover to traverse on foot across an area of now-vanished lakebed. The area is deeply riven by seasonal riverbeds and eroding cliffs of rock, sand and pebbles. Liu, or T.L., as he is known, specializes in studying rock varnishes–thin metallic deposits that accumulate on exposed desert rocks over hundreds or thousands of years. Their compositions can change, recording changes in humidity. This might allow scientists to chart past lake levels precisely. Currently, the lake's high point is thought to have been 5,000 to 8,000 years ago; T.L. 's job today is to collect rocks from the apparent highest spots, which will later go back to the lab for dating. Hiking across the sizzling surface, in late morning, T.L. searches for cobbles that look like they have lain undisturbed. Most appear to have been shoved around, but he finds a half dozen nestled in the sand with distinctly different colors top and bottom–indicators of useful specimens. Whenever the water disappeared, it must have had huge consequences for the people who lived here. Along parts of the old shoreline, one can see Stonehenge-like monoliths, finely carved bone harpoons and other remains of a lost civilization, about which very little is known. At one point, the researchers walk across an acre or so of stone roots from a petrified forest that must have grown during a wetter time. 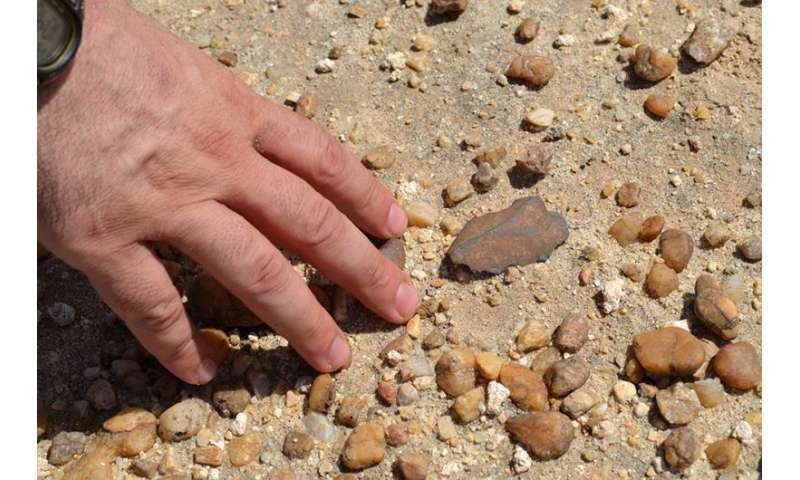 Later they spot a thumb-size stone projectile point, then a curved pottery handle, ages and makers unknown. Fossilized animal bones bleed from the fine sand near the bottom of a seasonal riverbed–maybe antelopes, pigs or other mammals, says Lepre. Some of the bones are surrounded by circles of stones; Lepre thinks these might be the leavings of a 1990s dig that turned up a few hominid fragments here of what could be yet another human precursor species. At noon, T.L. and Lepre lie down in the shade of a thorny acacia tree to avoid the hottest part of the day. About 100 feet away, a half-dozen teenage Turkana goat herders led by an old man lie under a similar tree. When break time is over, the Turkana come over to chat in Swahili. Karibu, says the elder: Welcome. Lepre is not fluent in Swahili, but he can get by. They discuss important things: why the scientists are here; the number of goats the old man owns; and of course the weather. The elder asks if Lepre has any tobacco, but Lepre does not. Lepre offers them some water, but the Turkana are already well equipped; everyone has a plastic jug, along with tiny hand-carved stools for comfort while watching goats, and curved sticks used for herding the animals or hunting game. These traditional tools look low-tech compared to the paraphernalia in the scientists' backpacks, but they are in fact exquisitely wrought, and provide almost everything the herders need for a day's work. Almost: Later that day, nearer the research station, a teen boy strolls by with a cell phone–probably the latest, but certainly not the last, new tool to enter this ancient landscape.